I never thought I’d say it, but the Jeremy Kyle show had quite an impact one day last month on our dental practice. Thanks to a recent programme featuring new cosmetic dentistry techniques and ‘instant’ veneers, our phone rang off the hook all day. Who’d have thought the show would have that much influence! You’ve probably heard of porcelain veneers, they’ve been around for quite some time. They’re the reason so many celebrities have perfect teeth and bright, white smiles. Simon Cowell, Miley Cyrus, 50 Cent, Katie Price and Hilary Duff are all rumoured to have got themselves a set of veneers – and at a celebrity price. A full set of porcelain veneers can cost thousands, and yes, we do still fit these when the occasion demands it. However, ‘instant’ or ‘composite’ veneers, at a fraction of the cost, put a fantastic smile within the reach of the rest of us, which I guess is why Jeremy Kyle’s show provoked such as response. But then, a dazzling smile, a more confident and youthful look – it’s a service that was always going to be popular, if only people knew it existed! The flexibility of this new material does mean that Instant, or Immediate Veneers are the modern answer to crooked teeth, staining or gaps between teeth. They are fitted quickly and easily over your existing teeth in just one visit to the surgery, and there’s no need for your own teeth to be filed down (as with porcelain veneers) so it’s pain-free too. Yes, really. If you think that sounds too good to be true – we thought that too, but there really isn’t a downside to this. 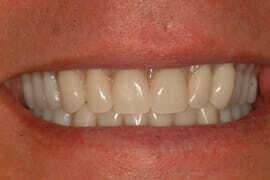 Instant veneers do look great, they are long lasting, and easily repaired if chipped. The cost is just £350 per tooth, which is about half the price of the porcelain method. When choosing instant veneers our main piece of advice is to find an experienced composite dentist. I know, we would say that, but not all dentists follow the same career path. It is different, because whereas porcelain veneers are made in a lab by a technician, instant veneers are shaped by the dentist in the surgery so your dentist needs to have a good eye and a little artistic flair! “Keep smiling – it makes people wonder what you’ve been up to.” Author unknown. How do you find a busy dentist? We have just posted a description of the kind (of) dentist that we are seeking to join us at the Winning Smiles dental practice. The dentist vacancy has been created by a steady increase in patient numbers over the last couple of years. And the only way we can continue being able to serve more people whilst still giving patients the time they deserve, is to find some help. We’re nothing if not logical around here. So if anyone reading this knows someone special in the field of dentistry, if you would be kind enough to point this job out to them, then we would be very grateful. We feel we should ask because we know that special people are always busy and aren’t always looking for a new role at exactly the time the perfect opportunity comes up! We’ll update you on our search when we have some news. Almarie Odendaal is the new orthodontist at Winning Smiles and is an expert in fitting braces using the new Damon System. 1. Damon braces typically provide excellent results in a shorter treatment time than conventional braces, and patients have to make less appointments. 2. Using the Damon System means that it’s very rare that a patient will need to have any teeth extracted, and they won’t have to wear any headgear during treatment. 3. Patients are a lot more comfortable during treatment. Damon braces use a new passive slide mechanism to maintain the shape of the archwires within the bracket. This allows the wires to move freely and reduces friction and binding, so your teeth can move quickly and comfortably. Other types of braces use elastic ties or active clips that bind archwires in place, this results in friction, making treatment slower and less comfortable. Elastics ties also attract a lot of plaque and so Damon System braces are also a lot easier to keep clean. Almarie Odendaal, joined our team in June. 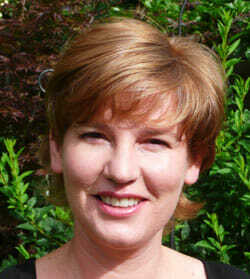 Almarie qualified as a dentist from the University of Pretoria in South Africa in 1993. She is a member of the British Orthodontic Society, the Faculty of General Dental Practice and the British Dental Association. You can book a consultation with her by dropping us a note via the form on the web site, or call us on 08000 90 10 60. Consultations are currently FREE! Here in Essex, Cosmetic dentistry is evolving. A decade ago when decent porcelain veneers came along cosmetic dentists were very keen on placing lots of veneers – in 2010 there are still a lot of veneers being placed by cosmetic dentists, but here at Winning Smile we believe that the Age of the Veneer is on the wane. A colleague of mine Dr Tif Qureshi (www.dentalelegance.co.uk) recently addressed the profession with his ‘evolved’ concept of Cosmetic Dentistry – updated to reflect the progress in dental knowledge and treatments within the profession and changing attitudes among our patients. Tif brought the Inman Aligner to the UK from the States and combines this brilliant little brace with 2 other treatments to produce significant dental transformation without the need to grind away good teeth as is the case with veneers. The addition of cosmetic filling material (like our Italian HFO system) where necessary to add the finishing touches. Here at Winning Smiles we have been using the bleaching and bonding techniques for years and Michael Fennell one of our orthodontists has been doing the straightening. We are no strangers to these ideas. But Tif has put a label on it for us, and we think people will be hearing of this costmetic dental technique a lot more. Cost – ABB costs around £2000 at Winning Smiles, 6-8 veneers cost £3600-£4800! Are false teeth now history? Times (they are) a changing. I’m actually not listening to Bob Dylan as I write this, but times are definitely changing in the world of UK dentistry, and where dentures are concerned, the change is accelerating. 20 years ago if you had lost all your teeth, false teeth or ‘falsies’ were your only option. Cheap and cheerful, available free on the NHS…and utterly hopeless as a functioning pair of teeth. Some of them looked ok and even stayed in when you were talking, sometimes! 20 years ago dental implants were in their infancy, only a few brave dentists with hugely rich patients ventured into such unchartered territory..
10 years ago if you had lost all your teeth (or a complete top or bottom set) then it was possible to find a few dentists with the ability to replace a whole set of top or bottom teeth – but the costs, although vaguely affordable for those with serious property equity, were still somewhat eye-watering. A full set of porcelain teeth needed 10 implants to support them and each tooth was lovingly crafted – the dental technician would spend days or even weeks making them. 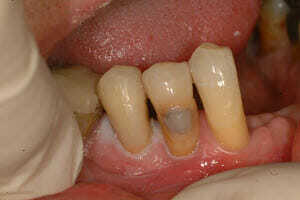 The only problem with implant retained dentures is that in patients’ eyes they are still dentures! They need to be removed for cleaning purposes every night….and no matter how well they stay in with their super-duper implant-connectors, they still have the ‘false teeth’ label. Enter the new era of ‘full arch’ implant dentistry [full arch: aka a top set, bottom set or complete set of implant-teeth]. Combining the ease of construction of implant-dentures with the satisfaction of having a set of fixed teeth that really feel like your own, without resorting to using 10 implants at a time and without the days and weeks of painstaking construction time at the dental lab…..it has become possible to completely replace a top set, bottom set or both for a rather less eyewatering fee than those huge ceramic bridges…. This has been made possible by using digital scanning/CNC technology to produce titanium ‘backbones’ with micro-tolerances that are screwed into place on as little as 4 implants for a full set. Top quality acrylic teeth are then firmly attached to the titanium backbone and the full arch titanium/acrylic fixed implant bridge is complete. How do they look? The photographs speak for themselves. Why precision 3D X-ray images are essential for safe and successful dental implant surgery. So what are the consequences of getting this wrong? -teeth ending up in the wrong place and looking ‘goofy’! At Winning Smiles we know how crucial this precise 3D imaging of the jaw bone is. That’s why we use the latest Specialist Dental CT scanner to produce 3D images of the jaws before surgery. These machines provide superb high resolution, high definition images. Armed with this level of information we have safely and successfully fitted around 600 dental implants in the last few years. And because the new generation of ‘cone beam’ dental CT units work with a radiation dose many times below that of hospital CT Scanners, they are not only more convenient (the whole procedure can be carried out here at our clinic), but they are also much safer. So if you’re looking for safe, convenient, successful implant surgery…..you can rest assured that that all comes as routine for you here. who’s lifetime, the dentist, the patient or the implant?! who’s going to guarantee those implants for a life-time? contract, those promises start to sound rather hollow! Having the right attitude helps! Patients don’t know when they haver peri-implantitis because it doesn’t hurt, right up until the implant tooth falls out! It is quite common that patients who are considering, or about to undergo dental implant surgery to be in the dark when it comes to predicting how much pain to expect. And although at Winning Smiles we always encourage new implant patients to have a chat with patients who have had the whole ‘implant experience’, most patients won’t actually take us up on that offer – even though our previous implant patients are usually very happy to talk about it! Recuperation period: 2 days, mild soreness around gums, most patients will go back to work next day without the need to take even an aspirin. Recuperation: 3-10 days. Mild to moderate soreness around gums, mild swelling. Individual patients respond very differently in these cases. For some patients it is very easy and they get only minor post-op soreness. At the other end of the spectrum a few patients will have to take painkillers for a few days and may bruise (in fair skinned patients the bruising can be quite noticeable). no pain during surgery, little or no pain afterwards with mild swelling. Bruising on fair skinned patients. Ok, again we would expect no pain during the surgery but considerable soreness/bruising and some swelling for 1-2 weeks afterwards. Similar to ‘complex’ cases above, it’s not something we enjoy doing to patients but in some cases the only way forwards – and they do work very well. This is a lot of detail, but we find people would rather know these things up front, rather than find out after the event. Andrew explains the pros and cons of the implants vs bridges argument and why he generally prefers to use dental implants to replace missing teeth these days. This is the blog about dental bridges referred to in the video. Length: 1 minute 50 seconds. Can you spot the grotty ‘white’ filling in the middle of the picture? Believe it or not this filling was not done at the turn of the century but completed a couple of years ago! People often ask if we enjoy dentistry. But who wouldn’t like being able to take out that grotty old filling and replace it with a nice shiny new one. We can get this invisible effect using our beautiful italian white filling materials, and a little bit of technique to go with it!! Quality dentistry costs less over time and makes you feel good.